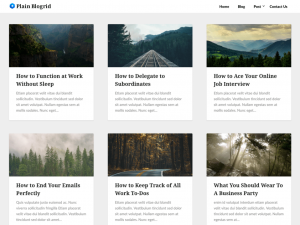 Plain Blogrid is a clean and creative blog theme. The theme is responsive, it is fully compatible with mobile phones, desktop computers and tablets such as iPads. The WordPress theme has a multi purpose design which is minimal and simple. The readability is optimized through great typography. Page builders work fine with the theme, and since it’s full width by default you can create a landing page or one page easily to visualize your business, agency or consultant company. (search engine optimization) and load time, so when your vistiors loads your site, they will have a great experience. There is also lots of space for ads through a lot of widget opportunities.